The concept of a written document for marriage lent itself to some popular Jewish customs, includ- ing the creation of allegorical marriage contracts for Shavuot. As the holiday marks the Giving of the Law, mystical traditions asserted that on this day Moses, as the matchmaker, brought the Jewish people (the bridegroom) to Mount Sinai (the wedding place) to marry God or the Torah (the bride). To commemorate this mystical union, among European Sephardim and in some communities in Islamic lands the custom has been to prepare a special ketubbah for Shavuot and to recite it in the synagogue prior to the reading of the Torah on the first day of the holiday. While several versions of ketubbot for Shavuot are known, the most popular in Sephardic communities has been the poetic text composed by the renowned mystic of Safed, Rabbi Israel Najara (1555?–1625?). A modified version of Najara’s text is employed in the present contract, in which the bridegroom, Israel, is introduced as “ruler of rulers … superior above all nations,” while the bride is “the dear and pleasant, a maiden of many virtues, God’s perfect Torah.” The father of the bride, God, provides his daughter with a substantial dowry, composed of positive and negative commandments; the bride- groom desiring to transmit these valuable assets to his descendents, willingly obligates himself to this bond. He will never take a second wife (namely, another religion), and neither abandon nor neglect her. Their dwelling will be in the Land of Israel, as Heaven and Earth witness the union. The wedding is recorded as having taken place on Mount Sinai on Friday, 6 Sivan 2448 (1313 BCE), the traditional date of the Giving of the Law. Divided into three sections, this special text appears within an imposing wooden architectural setting, comprising three arches and a broken pediment, within which is a crowned Decalogue. The upper story employs a dynamic rhythm of decorative architectural elements. 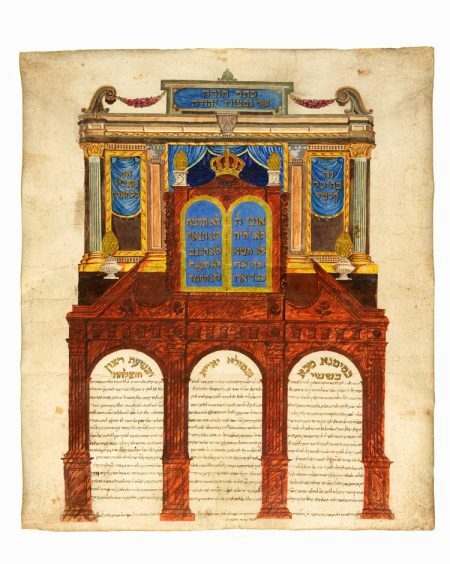 The entire structure resem- bles a typical Sephardic Torah ark (ehal) from the synagogues of Gibraltar. Indeed the name of one of these synagogues, Nefutzot Yehudah, founded 1799, appears at the top. Certainly this sumptuous ketubbah was once chanted there. Many other features associate the contract with the Gibraltar community and its ketubbot. Based on this example it is clear that the British crown in Gibraltar’s ketubbot (cat. no. 74) should be interpreted also as a Torah Crown. selected literature Local Goddesses 1994, p. 45.